With all due respect to the Christmas season, it’s the most wonderful time of the year. Welcome to our 2017 Stanley Cup playoff betting preview and picks page! In this article, we’ll look at the Stanley Cup futures odds and make a few suggestions, along with a look at betting odds and opinions for the first round of the playoffs. This year, we’ve decided to step things up a notch and reach out to some of the most popular and respected free NHL handicappers on Twitter to get their thoughts as well! 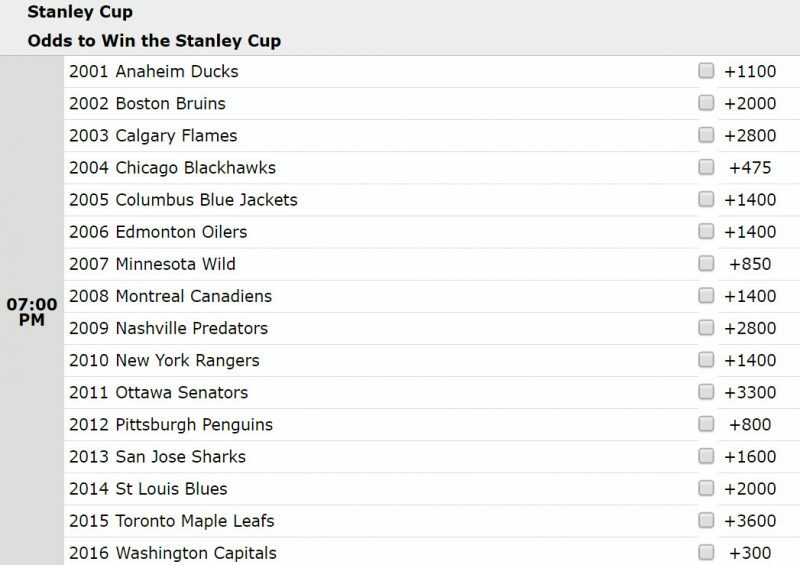 They’ll be giving us their favourite Round 1 series bet (based on both confidence and odds), who they like to win the Stanley Cup (with odds), and an undervalued team you might want to take a shot on the Cup futures odds, along with reasons why. @Nickortynski – Not only did Nick enjoy a terrific NHL regular season (303-242-18), he was very successful handicapping other international hockey leagues as well. Nick’s also a tremendous follow as one of the friendliest and most humble cappers you’ll come across on Twitter. 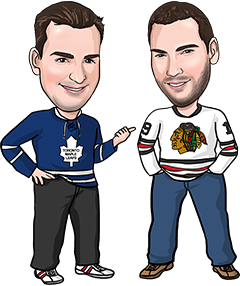 @BrendanFuture – Brendan’s multi-unit NHL bets (better known as Bigfoots, Nessies and Godzillas to those who know him) were pure gold this season, going an incredible 61-34-3. He once again finished the NHL season in the black after going 398-300 overall in the NHL the previous year. @BetBully – BetBully put up great results this year for the second NHL season in a row, winning +37.1 units after collecting +39.45 units in 2015-16. He’s also a great NFL capper, friendly guy and entertaining follow all around. @BetConsensus – BC runs www.HockeyConsensusBets.com, a website that puts out daily picks based on consensus of opinions between himself, @BrendanFuture, @Ants_Covers and @Khameleon619. The group finished the 2016-17 NHL season with an overall record of 117-104 for +17.4 units. @NHLTips – We posted betting opinions for every NHL game 6 days a week from early November until mid-March, along with stats, trends and info for all the matchups. Picks and leans finished the year with a record of 427-385 for +21 units. Alright, let’s get started! We’ll begin with a look at the Cup futures odds and opinions from each of our panelists, then check out the Round 1 series matchups. Strong goaltending from Holtby, who went 42-12 with a 2.08 goals-against average. Washington’s offence is second in the league (3.2 goals for per game) and their defence was first (2.2 goals against per game). A much improved team. Think this is the year for them. They’re notorious for choking in the playoffs, but they are much less dependant on Ovechkin this year and looking like a better team for it. The Capitals have the strongest goalie going into the playoffs. Hawks are once again the team to beat in the West, flaunting a deep, experienced team with top tier talent at every position. Chicago has home ice in the West and went 26-10-5 at home this season. It also helps that this isn’t their first rodeo, having won 3 of the last 7 Cups. Dominant from top to bottom. Holtby has matured to a point where he can now get the job done. Tried to think outside the box here but this certainly looks like it’s Washington’s year. We’ve liked their nemesis, the defending champion Penguins, all season but Pittsburgh just looks too banged up and might not even advance past the Jackets to get a shot at the Caps. Washington’s biggest challenger is likely themselves, making sure they don’t get inside their own heads when adversity inevitably strikes. Oilers return to the playoffs after an 11-year hiatus. Goalie Cam Talbot has been a workhorse, playing 72 games and going 41-22. Up front, the McDavid-led Oil have scored 235 goals (10th in the NHL at 2.9 goals for per game) and gave up just 203 (sixth in the NHL at 2.5 goals per game). With their speed and skill, this team could shock a lot of opponents. For the Wild, a lot of this depends on Dubynk, but with a 2.25 GAA and .923 save percentage he can take over a series. They also have the top 3 defenceman in plus/minus for the season and can grind it out when necessary. The Blue Jackets are another goalie-based pick. Bobrovsky led the league in save % and GAA. They get a shorthanded Pens team early on and if anyone can stack up against Holtby, it’s Bob. The Wild aren’t one of the favourites to win the Cup, but watch out because they could be dangerous. This is a team that is led by veterans and at most times a very stingy goaltender. They were on top of the Western Conference for the majority of the season before stumbling down the stretch, but if they get rolling again they could go deep. They finished the season fifth in points, boast the league’s second-ranked shooting percentage at 10.4% and were second in goals per game at 3.21. The Leafs pick is for a bit of a joke. But Sergio won, the Cavaliers won and the Cubs won. It makes perfect sense! How is anyone going to stop McDavid? Edmonton won 20 of their 29 Pacific Division games this year. The Rangers are a very dangerous seventh seed, considering they were one point behind Atlantic Division-winning Montreal and 3 points behind Pacific-winning Anaheim. Having the NHL’s best road record bodes well in the post-season, plus the bracket format of the playoffs means that New York wouldn’t need to face Washington, Columbus or Pittsburgh til the conference final. Note: These series prices were current as of Tuesday morning. They can fluctuate greatly, so you may want to double-check the odds at all of the best NHL sportsbooks before you make any bets of your own. If you’re looking for value, look no further than the Ottawa Senators at +160 at Bet365. In 4 head-to-head meetings this year, Ottawa is 4-0 while scoring 12 goals and allowing just 6 against. This year has seen the Sens netminders have a pretty solid year. Anderson’s .926 save percentage is among the league leaders. Bruins face the prospect of starting the postseason without defencemen Torey Krug and Brandon Carlo which bodes well for the Sens. I think they can score just enough in this series to win in 7 games, and if that defence and Anderson can perform, this series should go the Sens way. I think the Blues have overachieved down the stretch, and the Wild matches up well with them. They are typically strong defensively playing good two-way hockey and Dubnyk can be a top-3 goalie when he’s on his game. As we all know, a hot goalie can have a HUGE impact on a team’s playoff run. I also like the fact that the Wild can play with enough grit to hang in a tougher series, but they have a lot of team speed as well. I think they can handle an overachieving Blues team that has lost a lot of fire power. The Wild had five 20-goal scorers and 10 players who scored 10+ goals. The Blues won’t be able to keep up with Minny’s 3-line scoring attack. Edmonton is the smallest first-round favourite and I like the value. The Oilers have dominated Pacific Division opponents all year, winning 20 of 29 division games. The Sharks will struggle to stop McDavid. Talbot is looking good, while San Jose is not. Pittsburgh deserves to be the favourite and probably wins the series, but odds like this look very generous when you consider the teams finished 3 points apart in the standings and Columbus has held its own against the Penguins in recent meetings (5-3-1 last 9). If the Blue Jackets can steal one of the first two games in Pittsburgh, the Pens could be in some trouble. Columbus is 28-12-1 this year on home ice, while the Penguins were an unimpressive 19-15-7 on the road. The Jackets slumped down the stretch but may have gained some confidence from a 3-2 road win over a motivated Leafs squad in their season finale.